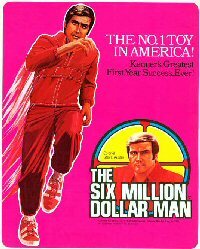 The Six Million Dollar Man spawned a number of toys and other licensed merchandise. Everything from lunch boxes and running shoes to children’s eyeglasses through to jigsaws, colouring books, comic books, trash cans, slide viewers, board games and bedsheets all of which carried images of Steve Austin. Universal took Tv show product merchandising to all new new heights that would only be exceeded by the release of Gorge Lucas' STAR WARS movies. Late 70's Christmas lists were not complete without some kind of Bionic-related present being required. 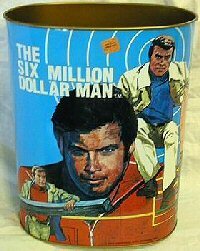 The 12-inch tall Steve Austin action figure marketed by Kenner in the mid-1970s was particularly popular and intact Six Million Dollar Man and Bionic Woman toys continue to attract premium prices on the collector’s market. Besides the lead characters, 12-inch scale action figures were also produced of Oscar Goldman (with an "exploding" briefcase similar to the type used by James Bond in From Russia with Love), "Maskatron" (an android character based upon a cyborg played by John Saxon in several episodes), a Fembot (from a Bionic Woman episode) and the recurring character of Bigfoot (the Bigfoot doll was more than 12 inches high). Associated merchandise for use with the action figures included a rocketship that could transform into a bionic repair station, an inflatable command base, auxiliary bionic arms (critical assignment arms) with different features (such as one that included a flashlight), auxiliary bionic legs (critical assignment legs) with different features. Fully intact Steve Austin action figures are rare, and can command a high price on the second market, sometimes into several hundred dollars. The bionic right arms of the dolls were covered in an elastic, skin-like material (intended to be rolled back to reveal bionic modules underneath) and this material tended to deteriorate over time. Early versions of the arms also included removable bionic modules that could be easily lost; later versions of the action figured included modules that could not be removed. Several high-profile Bionic fans have spent years tracking down every last item of merchandise they can find and their dedication to the cause is admirable. Several web sites are devoted are either dedicated, or have pages dedicated, to the Bionic toys and have some superb photo's and videos such as The Bionic Woman Toys, Bug Eyed Monster and Plaid Stallions and are well worth checking out. The original Steve Austin doll was 13 inches tall and wore a red NASA-style jumpsuit and red sneakers. Through a hole in the back of his head (ouch!) you could peer through his bionic eye — a wide-angle Steve Austin doll courtesy Brian Roachtelescopic lens. His right arm featured roll-back rubber "skin" that revealed removable bionic components. By hitting a button in the back (after twisting his head to the right) Steve's bionic right arm could lift objects weighing up to two pounds. You even got a plastic engine block for him to lift. Later, a second version of the doll was produced with Bionic Grip. 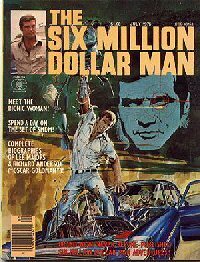 The Oscar Goldman doll wore a polyester jacket, beige slacks and brown leather shoes. Oscar came with an attaché case full of gear for directing OSI assignments. If opened the wrong way by someone unauthorized, the case would explode by having a panel fly off and the interior electronic systems short out. Inside the case, a secret compartment held a manila folder with mission documents for Steve Austin and a viewer you could adjust with a dial to see information on a video screen. 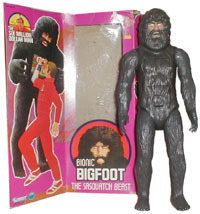 The Sasquatch doll towered at 15 inches. It was made of brown plastic molded to look like fur and had a pressure point Steve could hit so a panel will fly off to reveal the monster is actually a machine. Steve Austin also had bionic assessories. His Critical Assignment Arms came with a fabric T-shirt, and there were three bionic arms you could interchange with the original. The Laser Arm shot a red light beam. The Neutralizer Arm did karate chops and had a sonic stunner gun. The Oxygen Supply Arm had a retractable oxygen mask that fit in a hidden compartment. All the arms, like the original, featured roll-back rubber skin that revealed removable bionic parts. There were also Critical Assignment Legs that came with a pair of fabric shorts. 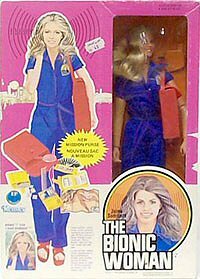 The Bionic Woman held a substantial share of the bionic toy market. The original doll came with a fabric top and jeans and white plastic sneakers. It was shorter than the male doll, measuring just over a foot. If you turned the head from side to side, you could hear a ping sound that was supposed to represent the bionic ear. Panels in the thighs could be removed to reveal bionic parts. The jeans had lift-off patches that allowed access to the circuits — a nice feature. The Jaime figure also had combable blonde hair. A later Jaime doll had feet that could turn and wore a blue jumpsuit and platform shoes instead of a jogging suit. It also came with a vinyl Mission Purse that contained a wallet, money, credit cards, a mission assignment, snapshots of Steve and Oscar, a comb, a brush, a cosmetic case with make-up, a map case with two maps and Morse code. No Bionic Woman is complete without a Styling Boutique. The boutique came with an eleven-inch tall bust of Jaime and a make-up tray with cosmetics, comb, brush, curlers and ribbons. There also was a line of fashion clothes for the figure, all of which included plastic shoes.